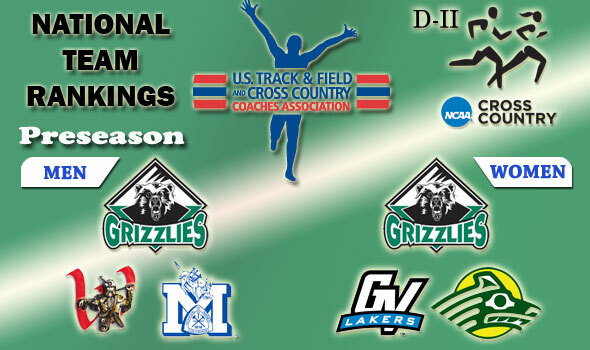 NEW ORLEANS – The U.S. Track & Field and Cross Country Coaches Association (USTFCCCA) announced on Wednesday preseason national cross country rankings for NCAA Division II. Adams State was selected as the leading team on both men’s and women’s sides and both squads are the defending national champions. The RMAC has four squads in the national men’s top 25 including Adams State, No. 2 Western State, and No. 3 Colorado Mines. The GLVC, GNAC, Northeast-10, and PSAC each have three of their members in the men’s top 25. The MIAA leads all conferences with four teams in the women’s top 25, including No. 8 Missouri Southern, No. 15 Truman State, No. 19 Pittsburg State, and No. 22 Northwest Missouri. The NSIC, GLIAC, PSAC, and GNAC all fall next in line with three squads listed in the top 25. The 2010 NCAA Division II Cross Country Championships will be held on December 4 in Louisville, Ky., at E.P. “Tom” Sawyer Park. The next national rankings will be released on September 22. 3 Colorado Mines Central RMAC Golden, Colo.
4 Grand Valley State Midwest GLIAC Allendale, Mich.
6 Western Washington West GNAC Bellingham, Wash.
7 Queens (N.C.) Southeast Conf. Carolinas Charlotte, N.C.
8 Southern Indiana Midwest GLVC Evansville, Ind. 9 Harding South Gulf South Searcy, Ark. 10 Augustana (S.D.) Central NSIC Sioux Falls, S.D. 11 Shippensburg Atlantic PSAC Shippensburg, Pa.
12 Edinboro Atlantic PSAC Edinboro, Pa.
13 UMass Lowell East Northeast-10 Lowell, Mass. 14 Metro State Central RMAC Denver, Colo.
15 Lock Haven Atlantic PSAC Lock Haven, Pa.
17 American International East Northeast-10 Springfield, Mass. 18 Drury Midwest GLVC Springfield, Mo. 19 Stonehill East Northeast-10 Easton, Mass. 21 Columbus State Southeast Peach Belt Columbus, Ga.
23 Pittsburg State South Central MIAA Pittsburg, Kan.
24 Bellarmine Midwest GLVC Louisville, Ky.
25 Fort Hays State South Central MIAA Hays, Kan.
2 Grand Valley State Midwest GLIAC Allendale, Mich.
4 Shippensburg Atlantic PSAC Shippensburg, Pa.
6 Minnesota Duluth Central NSIC Duluth, Minn.
7 Western Washington West GNAC Bellingham, Wash.
8 Missouri Southern South Central MIAA Joplin, Mo. 9 Western State Central RMAC Gunnison, Colo.
10 Tampa South Sunshine Tampa, Fla.
11 Augustana (S.D.) Central NSIC Sioux Falls, S.D. 12 Ferris State Midwest GLIAC Big Rapids, Mich.
13 Southern Indiana Midwest GLVC Evansville, Ind. 14 Seattle Pacific West GNAC Seattle, Wash.
15 Truman State South Central MIAA Kirksville, Mo. 16 Stonehill East Northeast-10 Easton, Mass. 17 Kutztown Atlantic PSAC Kutztown, Pa.
18 Slippery Rock Atlantic PSAC Slippery Rock, Pa.
19 Pittsburg State South Central MIAA Pittsburg, Kan.
20 U-Mary Central NSIC Bismarck, N.D.
22 Northwest Missouri South Central MIAA Maryville, Mo. 23 Columbus State Southeast Peach Belt Columbus, Ga.
24 Queens (N.C.) Southeast Conf. Carolinas Charlotte, N.C.
25 Southern Connecticut East Northeast-10 New Haven, Conn.